Our mission is to provide each individual a positive and progressive learning environment for scholar/athletes to become successful individuals that contribute to their community. We are an AAU affiliated youth sports performance program offering kids age 6-12 years of age dynamic programs in running, physical fitness, track and field, football, and other sports. We have kids from different backgrounds and sports interests. Our support programs provide each child physical and mental training for sports and educational support to help prepare them for the rigors of high school, college and life. 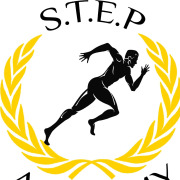 Would you recommend STEP Academy Track Club?